For the times you want to indulge in a slightly sophisticated treat, grab a few handfuls of this delectable milk chocolate bridge mix. mixture. You'll enjoy a sweetness from the raisins, a nutty, buttery flavor from the almonds and peanuts and a combination of chewiness and crunchiness. Additionally, you get to enjoy the pleasurable experience provided by the chocolate coating. 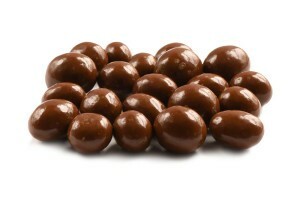 Milk Chocolate (Sugar, Cocoa Butter, Whole Milk Powder, Chocolate Liquor, Soy Lecithin (An Emulsifier), Vanillin (Artificial Flavor) Almonds, Raisins, Peanuts, Malt Ball Center (Corn Syrup, Sugar, Malted Milk Powder (Barley Malt, Wheat, Milk, Bicarbonate of Soda Salt), Whey, Vegetable Oils, (Palm Kernel, Partially Hydrogenated Palm), Cocoa (Processed With Alkali), Skim Milk, Natural & Artificial Flavor, Soy Lecithin (An Emulsifier), Confectioners Glaze. I am a fond appreciator of bridge mix and I am glad I found “Nutstop”. I purchased a number of their products immediately and one of them was the chocolate bridge mix. I found it to be a good quality product and very satisfying. It has a thick covering of chocolate and the nuts always have seemed fairly fresh and good quality. I would highly recommend this product. We jsu received our 5- 1pound bags of Milk Chocolate Bridge Mix. It is very good and we will definitely order again when this is done. Thank you for making a “Great Product” as we love “Bridge Mix”. Nice, but not exceptional. Chocolate covering is thick, almost soft.